Coconut thuvayal (தேங்காய் துவையல்) is a traditional Brahmin recipe and is prepared without adding water so that it lasts for a few days. Until couple of decades ago, people used to carry food during long journeys as food is not as easily available on the way. Curd rice, tamarind rice and idly were usually made for travel and coconut thuvayal was an essential accompaniment. Even today, after traditional Brahmin weddings, the bride is sent with the groom’s family with packed food called ‘kaatu satha koodai’ (கட்டு சாதக்கூடை) which usually contains mixed rice preparations and thengai thuvayal! Coconut thuvayal tastes wonderful when mixed with rice and ghee. 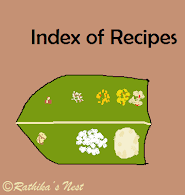 It also goes well with mixed rice preparations such as curd rice, coconut rice or lemon rice and tiffin items. Method: Heat oil in a kadai, add red chillies and when they become darker in color, add the dhals. Fry till the dhals become golden brown in color. Add asafetida and switch off the fire. Transfer the fried ingredients to a bowl. Now fry the coconut pieces in the kadai just for a minute. Grind coconut, fried ingredients, tamarind, asafoetida, and salt in to a paste. I prefer to grind the thuvayal without adding water. If you find it difficult, add just 1-2 teaspoons of water while grinding. Coconut thuvayal can be eaten with rice and ghee with appalam or vadam. Curd rice and coconut thuvayal make a great combination. You may also serve it with idly or dosa or mixed rice preparations.